The English verb ‘to err’ has largely lost its positive connotations. It no longer invokes wandering, rambling, or roaming, and is now understood negatively in relation to a prescribed path or goal. To be sure, errors are acknowledged to play an important role in the pursuit of knowledge and happiness, but usually only to the extent that their recognition allows for their elimination, correction, and avoidance. 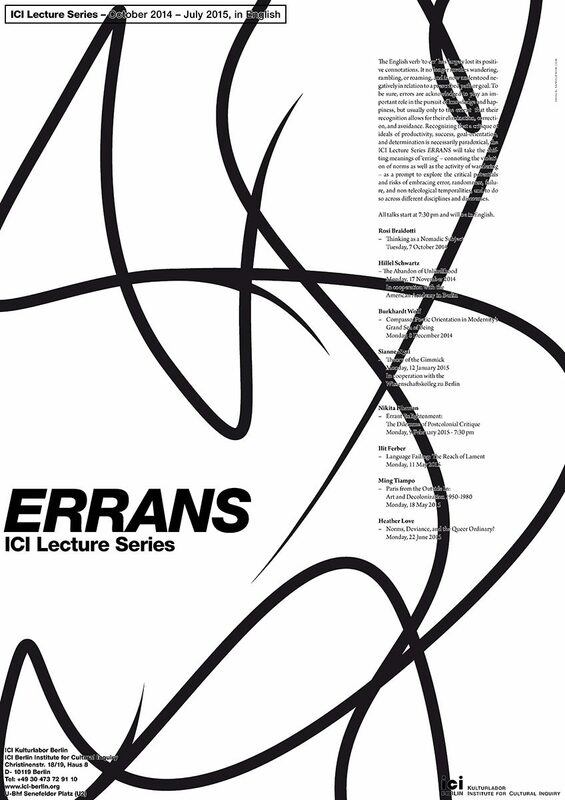 Recognizing that a critique of ideals of productivity, success, goal-orientation, and determination is necessarily paradoxical, the ICI Lecture Series ERRANS will take the shifting meanings of ‘erring’ – connoting the violation of norms as well as the activity of wandering – as a prompt to explore the critical potentials and risks of embracing error, randomness, failure, and non-teleological temporalities, and to do so across different disciplines and discourses. Erring may well be regarded a necessary condition not only for humanity but for life and history. An infallible adherence to norms and laws can indeed appear as a lifeless mechanism incapable of any novelty. It also resonates, for instance, with strategies of queering, feminist figurations of nomadic subjects, or postcolonial revaluations of hybridity and diasporic conditions. At the same time, a radical questioning of fixed norms, identities, and goals remains perhaps necessarily ambiguous when one asks about its aims and effects. How can one ensure that erring does not remain tied to a preoccupation with lack, existential rootlessness, truth, or authentic being? Does the possibility of a utility or productivity through serendipity not re-inscribe a normative teleology? While erring may be without goal, it may still find its end, which may become integrated into a history of progress or relegated to insignificance. With hindsight, erring indeed seems all too well suited for the neoliberal norms of flexibility: it is consistent with a logic of trial and error that promotes precarious errantry with the expectation that some will succeed and energize the economy, while the necessary failure of the many is absorbed through an ideology of hope and deferral or through (inner) emigration. Can errantry, moreover, really extricate itself from the logic not only of expansive exploration but also of colonization and its consequences of forced displacement and hybridization? To what extent can recent interventions on behalf of failure and against futurity respond to these concerns by radicalizing the play of error in errantry? The lecture series is part of the ICI Focus ERRANS 2014-16 and inaugurates the ICI Core Project ERRANS.